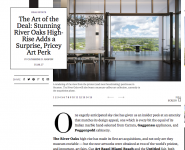 The River Oaks Luxury Condominiums are a beautifully restored Houston landmark. Weingarten Art Group partnered with Arel Capital, a nationally acclaimed New York developer, in their plan to fully revitalize and curate the complex. All public spaces and the first and second stories are curated with Weingarten Art Group’s expertise. The resulting collection of acquisitions is a reflection of the building’s inherent elegance, and developing this collection with care and precision was a two-year labor of love. 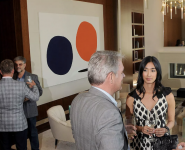 We have included strong Houston representation in artists like Paul Kremer, and premier gallerists including Moody, Inman, and Barbara Davis, among others. This client shares our value of artistic diversity, and the collection exhibits a bold mix of well-known artists and early discoveries.